I love to watch movies, but I can get stuck in a rut. I'm a big fan of romantic comedy, but I also love a great story. 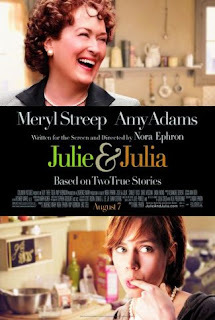 Since I am a self-proclaimed foodie, I decided that Julie and Julia would be a good pick for a Saturday night without my husband. I had no idea how right I was (coincidentally, I think my husband would have more than tolerated it). I laughed out-loud and got teary-eyed more than once. I finished the move feeling absolutely inspired (and not just because I'm a blogger) and genuinely motivated to do and be something better than I am right now. Who would have thought? It was an unlikely place to find inspiration, but there it was. The movie was a little blessing from Hollywood. It reminded me that we all have a time and a place. That it is one of life's greatest joys to have a husband who loves and supports you. That some of life's greatest accomplishments may take much longer than you expected and sometimes you are not expecting then at all. When you live a life of passion and purpose, anything is possible! Haven't seen this movie yet? Do it tonight! Is there a movie that inspired you? Please tell us!